completion of the programming sequence. Within 2 seconds of grounding the programming connector, the door locks will automatically cycle (lock then unlock) to indicate entry into programming mode. 5. If a second transmitter is to be programmed (including your old one), press the UNLOCK button on the second transmitter TWO TIMES, pausing one second between presses. In response, the door locks will cycle once within 2 seconds. 6. 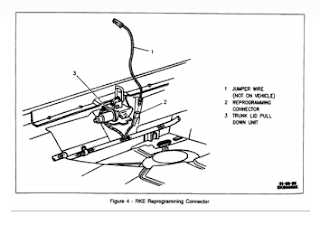 Remove the jumper wire from the Keyless Programming Connector and switch ignition OFF.